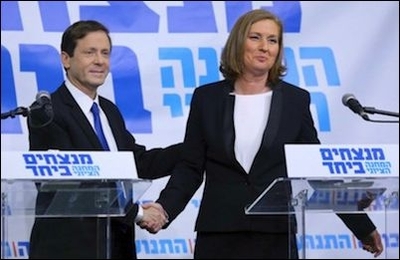 An electoral alliance between Labor leader Yitzhak Herzog and Hatnua party leader Tzipi Livni has upended the battle lines of Israeli politics. There was little public enthusiasm for the new polls. It is only 20 months since the last time Israelis turned out to vote. The 2015 contest will be the fifth general election in Israel since 2003. This means the average life expectancy of an Israeli government is less than two and a half years. It isn't a recipe for political stability, or for the pursuing by governments of clear and consistent policy objectives. Current opinion polls have this list neck and neck with Benjamin Netanyahu's ruling center-right Likud. Still, the present campaign is shaping up to be an interesting one. For the first time since the collapse of the "peace process" into war in 2000, Israel's center and left parties scent the chance of victory. The optimism of the left derives from a shrewd move by Labor leader Yitzhak Herzog. Previously regarded as the latest in a long line of no-hopers at the Labor helm, Herzog has united his Labor Party list with that of Tzipi Livni's "Hatnua" party. Livni drove a hard bargain. If the united list forms the next government, the prime ministership will be shared — two years for Herzog, two for Livni. Current opinion polls have this list neck and neck with Benjamin Netanyahu's ruling center-right Likud. A poll taken by the respected Geocartographia Institute on Sunday had the Likud on 27 seats, with Labor-Hatnua on 25. The right-of-Likud Jewish Home list was third with 11 seats. Because the ground around Israel is burning. A sectarian war between Sunni and Shia Arabs is raging in the large land area between the Mediterranean Sea and the Iraq-Iran border. To Israel's south, an Islamic State-affiliated movement (Ansar Beit al-Maqdis) is engaged in an insurgency against the government of Egypt. The Islamist Hamas movement remains firmly in control of Gaza, from where rockets continue to be launched against Israel. The Islamic State has begun to make its ominous appearance in Gaza too. Meanwhile, the government of Israel's main ally appears to be oblivious to the danger posed by the onward nuclear march of Iran. The PA's campaign has been encouraged from the growing hostility to Israel in some western European countries, particularly emerging from the growing political strength of Muslim communities in those countries and in turn from the sympathy for political Islam among those communities. It is possible that societal exhaustion and strong native traditions of anti-Semitism are also playing a role in this emergent stance. In the face of all this, the center left in Israel needs to explain why it is the government of Israel which is the cause of the country's difficulties. It needs to outline why its own more accommodating approach is more in tune with the underlying realities. The center left will argue that Israel's problems are to a great extent of its own making, and that if there is a danger of extremism it is to be found largely among Israeli Jews, rather than among their neighbors. The form that this will take is already becoming clear. The center left will argue that Israel's problems are to a great extent of its own making, and that if there is a danger of extremism it is to be found largely among Israeli Jews, rather than among their neighbors. Thus, in her most memorable statement so far, Livni recently told reporters that "(Israeli) extremists…are turning our country into an isolated, boxed-in country, and an alienating one — even for its own citizens." The belief underlying the Israeli center-left's campaign is evidently that if Israel is "boxed in" it is because of its own "extremists" and that the solution to this is greater accommodation to the U.S. administration. Thus, Israel has been infuriated by the administration's decisions to leak information on Israeli targeting of regime and Hizballah positions in Syria — moves Israel found necessary to prevent the arrival of game-changing weaponry to the Shia Islamist group. Similarly, during Operation Protective Edge, Secretary Kerry sought to involve the Muslim Brotherhood bloc of Qatar and Turkey in efforts to mediate a ceasefire, and was critical of Israel's tactics during the war. An Israeli government which believes that Israeli "isolation" is mainly Israel's fault and which thinks that the solution to this is greater accommodation to the Obama administration is an Israeli government which will be less likely to act in Israel's vital interests, at the right time and with sufficient determination. This, in turn, is likely to increase the threat to Israelis — see the 2000-2 period, when a reluctance to abandon the internationally sanctified illusions of the "peace process" led to a failure to act against the Palestinian terror campaign in a determined fashion. But if this is indeed to be the thrust of the center-left's campaign in the elections, success is likely to continue to elude it. Israelis are deeply aware both of the threats that surround them, and of the cold attitude of the current U.S. administration toward their country. A campaign which seeks to blur or obscure these or to claim that they are largely of Israel's own making is likely to win its proponents a further term in the opposition.